Austin, Texas, is known for its high-tech innovators. The city developed its reputation in part because of original technology innovators like Fred May and his co-workers. Born and raised in Prestonsburg, Kentucky, Mr. May graduated with distinction in 1958 with a Bachelor of Science in Electrical Engineering from the University of Kentucky. 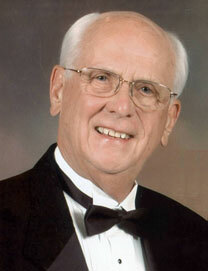 As a student he was a member of Phi Sigma Kappa fraternity and Tau Beta Pi, and served as president of Eta Kappa Nu. He went on to earn his master’s degree in electrical engineering in 1961 from the University of Tennessee while working full time in thermonuclear plasma research at Oak Ridge National Laboratory. That same year, Mr. May started what would become a long and distinguished career with IBM, returning to Lexington and joining the electric typewriter division as an associate engineer. He quickly climbed the corporate ladder, designing small office machine prototypes using combinational transistor logic circuits, magnetic recording, and magnetic core memories. He was named senior engineer in 1967 – his fifth promotion in six years. During this time, Mr. May led the design and development of the electronics for the Mag Card/Selectric typewriter. With dreams as big as Texas, Mr. May moved to Austin in 1968 to head up a new development laboratory staffed with 31 engineers and technicians. Just four years later, the lab had expanded to a staff of 240 engineers and technicians. By this time he also had received six U.S. patents. A move back to Lexington in 1972 included new responsibilities in the office products division (OPD). As vice president of engineering, he led the group of 2,000 employees in four locations across the country. While in Lexington, his burgeoning responsibilities increased to worldwide product management in six business areas with $2 billion in revenue. OPD microprocessor chips, organic photo conductors for copiers, and ink jet and laser printers were some of the key technologies in development. In 1976, Mr. May returned to Austin to serve as vice president of office systems. In the 1980s the Austin lab, working with IBM Research, began focusing on alternative products to mainframe computers and Mr. May was ready for the challenge. He led the initial work in the selection of UNIX as the operating system of choice for advanced workstation development, and was instrumental in the development of the RT/PC, the first RISC-based computer in IBM. This RISC microprocessor technology has grown to become the core of IBM computers. After 26 years of service, Mr. May retired from IBM in 1987 at the age of 50. He spent the next 12 years as a management consultant, working on 50 projects large and small, covering a variety of computer technologies and products. During this period, he also worked six years as a research associate in the electrical and computer engineering department at the University of Texas and served eight years as a board member of Ross Technology, a company founded to develop RISC microprocessor chips using Sun Microsystems’ SPARC architecture. Now that he has officially retired, Mr. May enjoys playing about 100 rounds of golf each year. But much of his time is spent pursuing his passion of Eastern Kentucky history and May family genealogy, having traced his family back 12 generations. He maintains a website for the Samuel May House in Prestonsburg, has written two books on the May family, and continues with his research. Mr. May and his wife, Darlene, live in Austin, Texas. They have three children and three granddaughters.